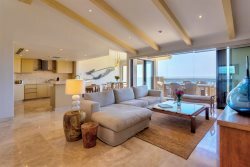 Villa Esquina is split level villa located on the 1st green of the Nicklaus golf course in Cabo del Sol. The villa has 5 bedrooms ideal for a family retreat. The main floor has a fully equipped kitchen and butler´s kitchen. The dining room and living room opens up to a large shaded exterior dining and living area great for entertaining. Here you will find a built in gas BBQ, small fridge, pool & Jacuzzi all with golf & ocean views.